What the heck is that tall tower next to the Casino? “The Glad to See You” Tower. By Paul Goldfinger © The Casino is in the center of the photo. We’ve all walked by that peculiar-looking building on the left side of our photo above, adjacent to the Casino in Asbury Park, at the Ocean Grove North End. Marlo was able to get information and access inside of that mysterious place. He succinctly refers to it as “the steam power plant,” a name known to many old-timers in this part of the Jersey Shore. 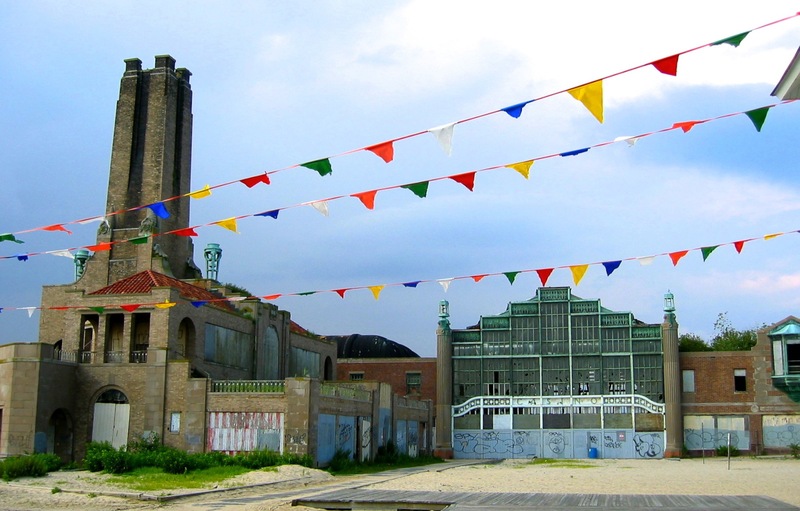 The steam plant was built in 1930 in order to provide heat to boardwalk attractions so that Asbury Park could compete year-round for recreational business. 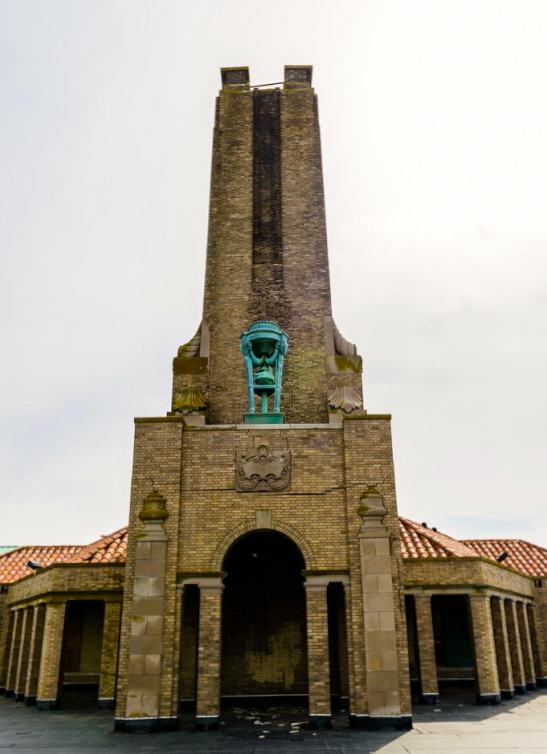 It was designed by Warren and Wetmore from New York City who were responsible for other Beaux Arts structures nearby, including the Casino, Convention Hall, Paramount Theatre, and the Berkeley Carteret Hotel to the north. Inside were three huge boilers that used oil to create steam for heat. The heat was pumped through pipes to the various buildings. Water may have been obtained from Wesley Lake or even dumped into the Lake. There is no information as to the success of the project, but evidently it wasn’t used once WWII occurred. Dramatic photograph inside the steam power plant, by Marlo Montanaro. © You can see more of these wonderful images by clicking on his link below. Marlo’s photos posted here with his permission. Since then it has stood as a monument of sorts to a utility that lost its purpose over 70 years ago. 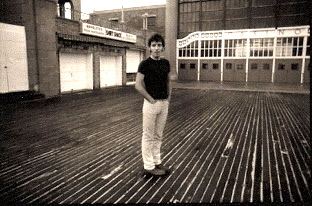 In the late c. 1960’s we have a photo of Bruce Springsteen, another Asbury icon, standing north of the tower. “Young Bruce” at the north end of the Asbury boards. Photo by Emil Salvini. In 2003, a developer wanted to move the Stone Pony into that steam building, but, of course, that did not occur thanks to a lot of noise by the Cousin Brucie rock ‘n roll crowd. 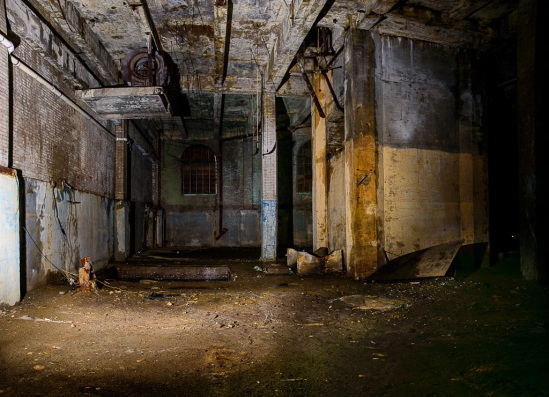 The most original recent contribution to the known history of the steam power plant are the evocative interior photographs that Marlo Montanaro posted last April with his detailed review of the subject. Below are two links to Marlo’s blogposts dated April, 2014. Thanks to Joel of OG for tipping us off to the Marlo post. I’ve painted the building many times, from many different angles. I will look for some vintage pics on-line, they are out there. I do know it had a decorative extension on top at one time with beautiful copper light fixtures. Excess steam cooled at the top and ran down the channels on the four sides, or so I was told by my father who saw it in operation in the 30’s. I do remember being able to walk along the gallery on the lakeside. I guess I’m old if I can remember that. There used to be a putt-putt boat amusement next to the building. Thank you so much for the article Paul! I would love to see vintage pictures of this building, or hear accounts of its operation and subsequent shutdown. Any/all information is welcome. I’d like to write a future article to correct any inaccuracies in my research, and add to the insight. Information on this building is amazingly difficult to find in the public record. Feel free to reach me by email (marlo@marlopix.com) or on Facebook. That youngster was born to run like no other and still is! The old color movies of Asbury Park he has on his site are amazing, from the 1930s, a glimpse back into the past.